Welcome to the CSFC Website! 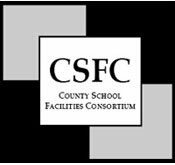 The County School Facilities Consortium (CSFC) was formed in 1993 to promote and support state funding for county-operated school facilities. CSFC is a diverse group representing small and large counties located throughout California. CSFC advocates for legislation and state regulations that will support all aspects of county office public school facility construction. CSFC regularly interacts with state agencies such as the California Department of Education (CDE), the Office of Public School Construction (OPSC) and the State Allocation Board (SAB). Participation is encouraged in person at our Sacramento office or by phone. Our next monthly meeting will take place via conference call or in-person at 1:00 p.m. on Wednesday, April 24. Check your email for meeting agenda and call-in information. CSFC Budget Update: Proposition 51 Implementation and County Office of Education Issues...click here for more. Sacramento Bee Capitol Alert: California Approved $9 Billion for Schools. Why Aren't We Spending the Money? Sacramento Bee Op-Ed: Why is State Being So Stingy on School Bonds? CSFC Budget Update: School Facilities Proposals and Proposition 51 Implementation...click here for more. CSFC Budget Update: Governor Signs Budget; New Threshold for DSA Submissions...click here for more. CSFC Budget Update: May Revision - Governor Proposes New Emergency Repair Revolving Loan Program...click here for more. Juan Mireles appointed Director of CDE's Scool Facilities and Transportation Services Division...click here for more. CSFC Budget Update: Governor Brown proposes ongoing dialogue for state facilities funding...click here for more. Join our efforts by becoming a member of CSFC! The County School Facilities Consortium (CSFC) advocates for quality school facilities for all students by focusing on flexibility in California's school facility funding program, promoting equal access to funding for county offices of education, and engaging on legislative and regulatory issues.